In its simplest form, the relationship between a commercial photographer and client can be summarized as: The photographer takes the photos and the client tells the photographer which photos to take. In years past, each commercial photography client had what’s called an ‘art director’. Art directors are much like movie directors, in that they specify which angles to shoot, which props to use and the art director would also often handle model castings and location bookings. Art directors would often be on set, directing the course of the shoot, reviewing images and providing helpful feedback to direct the course of the shoot. Modern times have seen a more ‘streamlined’ approach to commercial photography and the job of the art director is often now a collaborative effort between the photographer and the client, making well written creative direction all the more crucial. An effective shoot brief can completely alter the course of a photography project for the better, by providing the photographer with a clear idea of what they’re shooting and which images are essential to the client. Whether your project is white background product photography for Amazon listings, or a commercial lifestyle shoot, Having the correct information in advance ensures that the estimate you receive will be accurate and that you’ll be satisfied with the work the first time around. The email that every commercial photographer dreads receiving after a shoot is: “These need to be reshot because….” Reshoots are expensive and who pays for the reshoot is dependent on whether or not the missing detail was included in the clients’ creative direction. If a client requests 500 images of pill bottles, but fails to mention in their creative direction that the top should be unscrewed and there should be a subtle shadow beneath the bottles, the photographer is not at fault. But on the other hand, if a client specifies in their written creative direction that a model should be wearing ‘neutral colors’ and the photographer dresses the model in bright red, then the photographer must provide a reshoot at no charge to the client. Remember to keep it short and sweet – It’s called a ‘brief’ for a reason! Creative briefs should be no more than five pages long. Keep buzzwords and jargon to a minimum. Terms such as ‘3D looking’ and ‘HD looking’ ultimately mean nothing. Likewise, telling the photographer to ‘create unique images that are different from competitors’ is vague and would require massive amounts of research into all of your competition. Be granular! If you require an image of the front of a pill bottle, does it matter if the image is taken from a high angle, a low angle or straight on? If so, please make sure to indicate that in writing to ensure that you’ll be satisfied with the end result. If you have photo examples, these are a wonderful addition to your creative brief. While knowing what you like is helpful, sometimes it’s even more helpful to know what you don’t like. Who is the photography for? If you are an Amazon seller and this is for your company, this is helpful to know. If you are an advertising agency or a media buyer looking to resell the images to your own clients, this is essential to know as well. What are we shooting? Describe your products without ambiguity. If your briefing states that you have ‘health and beauty’ products, it’s helpful to know which health and beauty product we’ll be shooting. Different products have different logistics and knowing what we’re shooting and how many of each can have a large impact on the logistics of the shoot. When are you looking to have your project completed? In general, estimates are valid for 7 days. If your project timeline goes beyond that, we’re happy to provide you with a rough estimate that can later be refined when you’re closer to booking. Likewise, if you’re on a short timeline, knowing this will help us to decide if we are able to complete your project. How many products and images do you require? An itemized shot list is easy to digest and very easy to reference during a shoot. We are glad to employ some creativity of our own by providing variant shots, multiple angles and entirely new concepts that we make up on the fly. But having a list of core deliverables ensures that we capture the images that you need in order to make your project a success. Sometimes why. Having examples of how to shoot a product a certain way is wonderful, but sometimes it helps to know why it’s shot that way, in order to ensure a degree of consistency among your images. Should your product never be turned upside down because it will shatter? This is great to know in advance. While I could provide dozens of examples of poorly written creative briefs, I’d much rather offer some examples of well written creative direction instead, along with my notes on why the creative direction works so well. I absolutely adore the level of detail that this client included in their shoot brief. Having never used a CPAP pillow, it helped me immensely to know which way to turn the pillow and saved a considerable amount of time knowing which expressions or poses the model should be demonstrating. This is another instance where showing images that the client did not like were just as helpful as showing images that the client did like. Even standard product photos benefit significantly from having simple example images shot with a smartphone, especially when you have a beautifully unique product such as this. 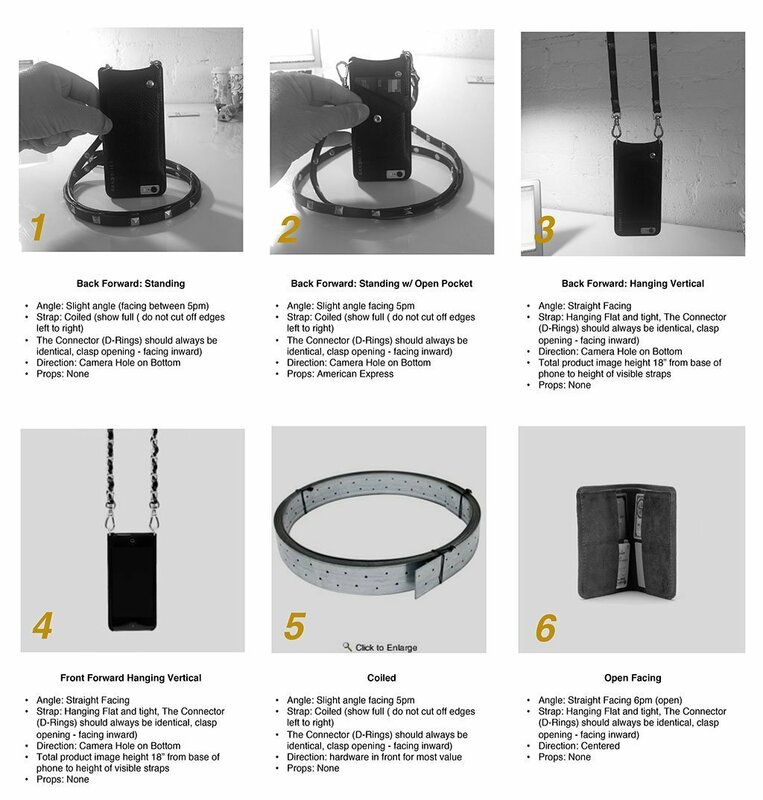 Look at the wonderful detail that this client included – everything from the angle to shoot the products at to the styling of the belt. Look at the level of thought and detail this client included with their creative brief. Everything from the age and ethnicity of the model, to her wardrobe and even the poses. In closing, creative briefs, shot lists are an essential part of the successful relationship between photographers and their clients. The more we know, then the higher the likelihood that you will be satisfied with the end result. Deacon Tyler is a Los Angeles photographer, specializing in product photography, branding, fashion and portraiture.